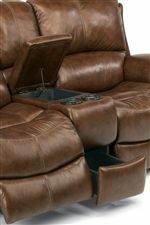 If you're looking for a recliner that will stand up to rowdy kids, dogs, cats, and the test of time, than this is it. This reclining loveseat features a time-tested construction of Dualflex springs built into a steel frame. A high density foam and fiber cushion provides resilience that's the perfect complement to a firm-sitting, protected leather covering. Plush upholstery techniques like a comfy pub back cushion and folded pillow arms create the perfect place to snuggle up for a nap or movie time. The Latitudes - Dominique Casual Reclining Love Seat with Power Motion and Drink Storage Console by Flexsteel at Jordan's Home Furnishings in the New Minas, Halifax, and Canning, Nova Scotia area. Product availability may vary. Contact us for the most current availability on this product. The Latitudes - Dominique collection is a great option if you are looking for Casual furniture in the New Minas, Halifax, and Canning, Nova Scotia area. Browse other items in the Latitudes - Dominique collection from Jordan's Home Furnishings in the New Minas, Halifax, and Canning, Nova Scotia area.